I cannot believe I am here again. I am currently expecting my 2nd child. After the birth of my first child, the main reason why I left my well-paying job in Boston with excellent benefits was to have more flexibility with my schedule. As a mother I needed to be there for my child. Another major component of my job change was to avoid the glass ceiling; just because I became a mother doesn’t mean that I all of a sudden don’t care about my career advancements. I have had the amazing opportunity to build a company from the ground up these past four years, but I find myself questioning why do we have no paid maternity leave policy! We are a small business. We have no short term disability. The new MA law for Paid Sick Leave does not apply to our organization, because we are too small. FMLA does not apply to us, because we do not have enough employees. A company of our size is only required to hold my job for 6 weeks vaginal birth and 8 weeks cesarean. That means, if I do not put my child in daycare at 6-8 weeks old, I can potentially lose my job. This practice, unfortunately, is the norm. I have nothing bad to say about my organization. One of the main reasons why I left my old job to start this company was to accommodate my new growing family and the flexibility that we needed in addition to growing my own career and personal experiences. This is a company that I have built, something that I have poured my blood, sweat, and tears into. It is just a major wake up call about how in business, you need to put every scenario on the line day 1, or you put yourself at risk. I have faith that my organization will try to accommodate my needs, but the reality is that they don’t have to. What is the issue with providing paid maternity/paternity leave to families? The standard rebuttal: Who will pay for it? It is hard not to feel like another pregnant woman inconveniencing today’s workforce. The general consensus (through the lack of legislation) is that our needs don’t matter, our families don’t matter, and our voices are silenced. There is a balancing act that is inherent to your future success within an organization: taking the policy they offer with a smile on your face and show up to work with no personal issues. Perhaps you are feeling under valued as a resource simply because you are a mother. Don’t get me wrong; I am not advocating for laziness in the workplace or a consistent interruption of personal family matters, but the reality is that we are dual working families. Our families are important to us. Our jobs are important to us. Why are we not considered important enough to have the support that we need and deserve? Potential mothers out there, I bid you fair warning. If you are planning to start a family some day, find a company that will respect your specific needs for paid time off, paid maternity leave, flexible schedules, and a solid low-cost healthcare program. Companies that do not offer these benefits don’t deserve you. In typical business terms, prove it in the numbers. A report by KPMG, commissioned by Vodafone, found that global businesses could save up to $19 billion per year if they adopted Vodafone’s policy. KPMG said companies spend roughly $47 billion every year recruiting and training new employees to replace women who leave the workforce after giving birth. Offering 16 weeks paid maternity leave would cost only $28 billion a year, the report said. 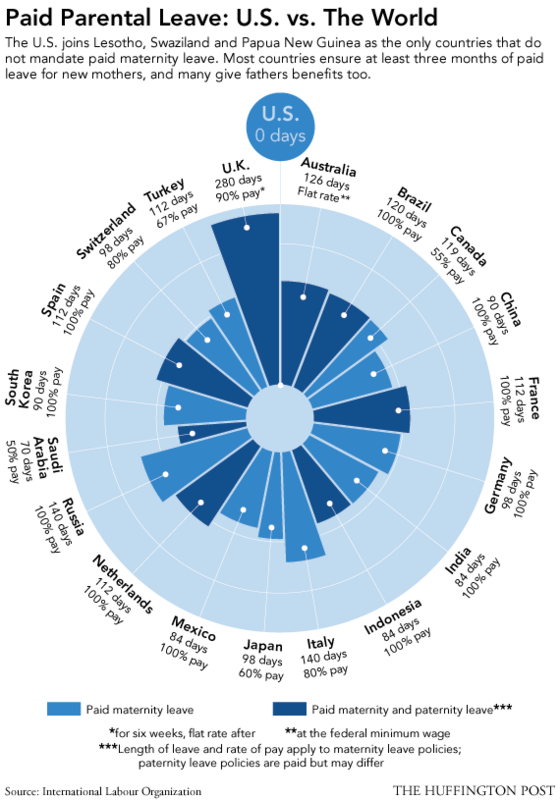 With the U.S. is being the only developed country with no guaranteed paid leave for new moms, according to the OECD, we are not left with much hope. Each baby brings up new emotions for the working mother force. It is time for change, and hopefully in our lifetime we will see more advocates for this cause. Find a culture that holds the same values as you do. Is your company building that culture or are they stuck abiding by the culture of the “norm”? Hopefully in our children’s lifetime, we will encourage enough change to embrace a culture that offers paid leave, alleviating worry and stress about lack of financial stability. Until then, we will long for a culture that respects working women, mothers, the future of our children, and their need for their parents during the first few weeks of their lives.